Summer is hot & humid in our part of NE Texas & I’m doing all I can to keep my plants watered. A cistern mishap involving a split hose drained all the rainwater from my 18′ deep cistern. WOW! So I’m trying to conserve water as much as possible. I came across a large-mouth bottle with a built-in grip on the handle and a metal-center lid and the thought occurred to me – maybe I can use this to keep my container garden of spinach watered. You remember my battle cry, “Use WhatCha Got!”. 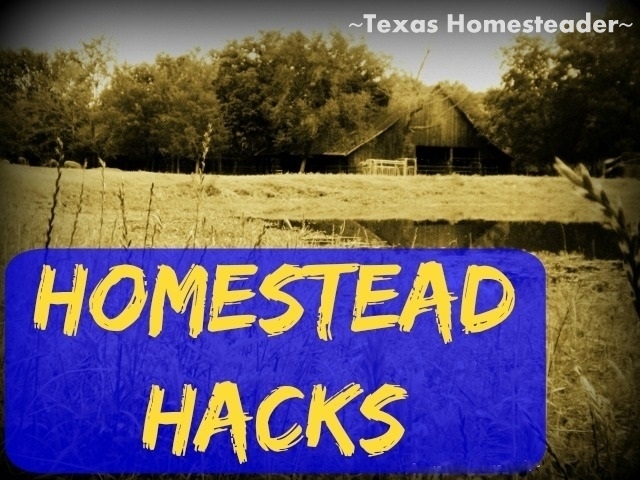 Check out this homestead hack. 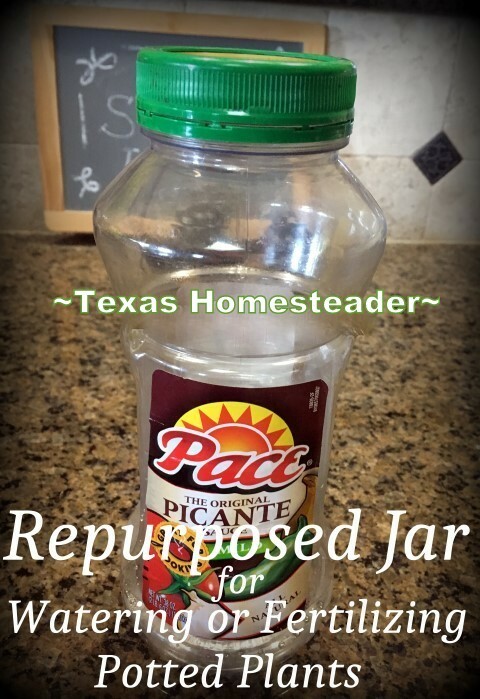 I emptied out a plastic picante jar and washed it well. Then I took it to RancherMan and asked him to drill tiny holes in a tight triangular pattern. I figured I could use it to add fertilizer and hand water smaller potted plants, but today I’ll use it to slowly soak in my rainwater into my large container of Malabar Spinach. Aaaanyhoo – I unscrewed the lid of this repurposed jar and filled it with rainwater from my rain barrel and screwed the lid back on. And now for the complicated part… I turned it upside down between the two plants and sat it directly onto the mulched dirt. It s-l-o-w-l-y drained water from those tiny holes and watered the plants. This allowed that precious water to soak in thoroughly and water both plants. I’d say it was a screaming success in keeping my Malabar spinach growing this summer. I had to rig up a trellis for that vining spinach – it grew vigorously! So if you have a wide-mouth jar with a metal lid, give it a try. it worked well for me. 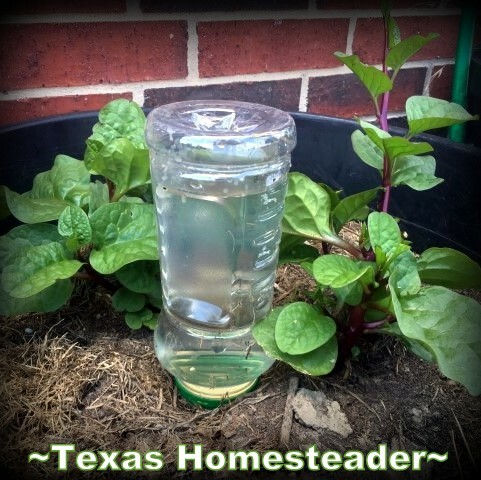 This entry was posted in Blog Posts and tagged Environment, Gardening, Homestead Hacks, Make-It-Yourself, Summer on July 27, 2016 by Texas Homesteader. Awesome Idea! Thanks so much for sharing with us at the Homesteader hop! I really need to do that trick for my containers… I have such a hard time remembering to water them! Thanks for linking up at #SustainableSundays! What a great tip! 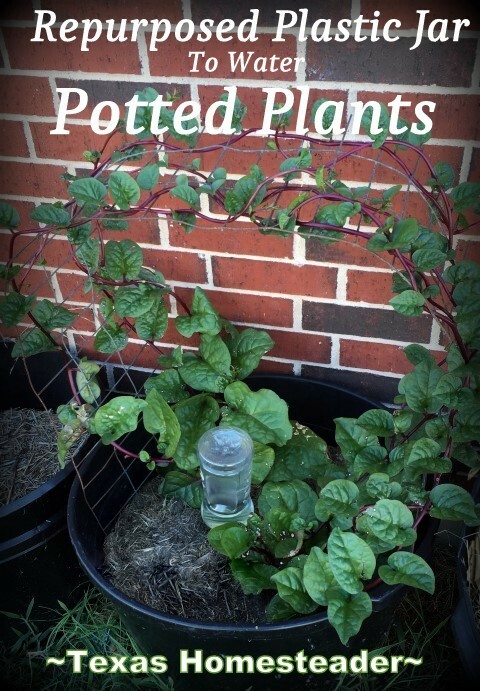 I’m excited to read that Malabar spinach works well in hot humid weather…I may have to try it here in the panhandle of Florida! Thanks for posting on the #sustainablesunday! I have water bottles upside down in my container gardens as well but I cut the bottom off so I can give them an extra drink while watering the plants in raised beds. I guess with the entire jar entact it wouldn’t evaporate a quick. Malabar produces a lot of seed so it will be good for sending some off as Christmas presents this year. I love adding a few leaves to a sandwich or to a regular salad. Glad it came back for you. It”s very hardy and even likes a little shade. Time to go clip some before it gets too hot! I can sure use these kind of tips with growing plants and I wish I could grow spinach, we love it, but so would my bunnies, lol! What a clever trick of keeping it watered in the heat! Awesome! Great idea to keep the water from running out the bottom of the pot. I also like your spinach. I will write the name down and see if I can find it next year to try. Do you save the seeds? What a great tip! I’m going to have to try this. Our heat has been in the high 90’s and we have had a few days of 100+ weather here. My poor plants are suffering in this heat. We had to partially cover the arctic kiwi plant because it was being burned to a crisp even though we moved it to an area where it does not get as much direct sun.